The five components of soil feed the world's plant life. All parts of soil are essential to plant development, and each is necessary for plants to survive. The composition of the components inside soil varies to create different soil types. Soil that is classified as clay, for example, contains more water than light, sandy soils. Soil is composed of five main basic components, including water. The four main components of soil are rocks (minerals), water, air and organic material (leaves and decomposed animals, for example). The fifth component of soil, which isn't always recognized, is the living world that exists under the ground -- the biological component. Rich garden soil is approximately 45 percent rocks and minerals, 5 percent organic matter and 25 percent each water and air. All soils have some mixture of the five basic components, and most soils may be amended to improve that composition so it will be more suitable for plant life. Air is not solid or liquid, but a combination of gaseous elements that are found naturally in Earth's atmosphere. In soil, air pockets allow water to pass through the soil and into the plants growing above and below the soil line. Water in soil usually contains dissolved salts and other chemicals. Water is an essential part of soil; plants cannot survive without it. Some soils, like clay, retain water much better than others. When water lingers in soil instead of passing through it easily, the soil becomes more densely packed. Some plants cannot grow in heavy, moisture-rich clay soils. All soil is composed of sand, silt and clay, though some types of soil have heavier concentrations of these minerals than others. Rocks and minerals make up the largest chunk of soil's composition. The rocks and minerals found in soil come from nonliving, inorganic materials. Sand comes from small fragments of quartz and other minerals, and by itself is not rich in the nutrients that plants need. Sand is the largest and coarsest of soil particles; water passes through sand more easily than other soil types. 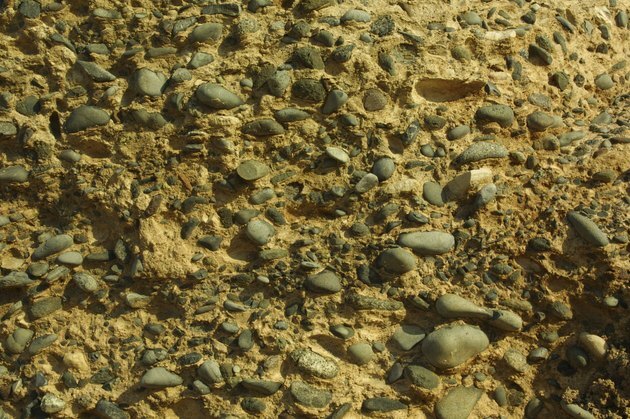 Silt is a combination of quartz and other rocks. Silt particles are smaller than sand but larger than clay. Clay is the richest of soil minerals, containing nutrients like iron, potassium and calcium. The smallest soil particles come from clay, which can become very dense and hard to work. Decayed plants and animals provide the organic materials found in soil. Through decomposition, organic materials are broken down and turned into nutrients that plants can use. Mineralization also occurs through decomposition, and through this process organic materials become inorganic. The fifth element of soil, the biological world, provides these important organic elements that are so essential. Plants and animals, when they die, become part of the ground once more -- and so the cycle continues. Soil gives life; life gives itself back to the soil.